Check out our full review of the Pebble smart watch. 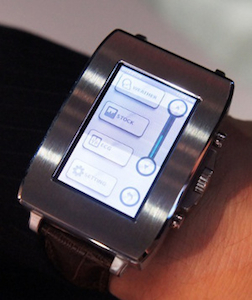 Are you ready to be inundated with smart watches? You better be. Apple, Samsung, LG and Google are all currently linked with building such a device, and should they all go on sale, you can bet many other manufacturers will soon follow. The thing is, smart watches – the name given to a wrist watch which connects to your smartphone via Bluetooth – are not a new concept. There are probably more examples than you imagine, but the reason they’ve never caught on has little to do with functionality, and everything to do with the fact they’re almost universally ugly. Seriously, they’re hideous. Wearable technology, a phrase were going to hear a lot this year, is a very different buying proposition than tech you don’t wear. It’s no longer something which is hidden away, left at home, or something where function matters over form. It’s a device we’re placing on our bodies and thus is in the public eye. Like it or not, wearable tech is as much a fashion statement as it is a boost to our geeky credentials. The watch itself has shifted from being an item of necessity to a piece of jewelry, where the massive faces hold back a shirt sleeve so it can be seen by everyone. To make the most of a smart watch, it’s going to have to be worn all the time, and who’s going to do that if it makes them look bloody stupid? Smart watches are interactive, which means we’ll always be pawing at them, so it’s inevitable attention will be drawn not only to the design, but also how we look when we’re operating it. In our geek minds, prodding at a tiny screen on our wrist makes us look sci-fi cool, but in reality, we’ll look the same as people tapping out a few quick sums on a calculator watch in 1983. Do we need to remind you that wasn’t a good look? Ugly stick at the ready? Time (sorry) for some examples. Back in 2009, LG released the GD910 watch phone with the optimistic tagline, “Wear the future on your wrist!” The design, with its black strap and chrome face bezel, is quite subtle. In most pictures it looks perfectly acceptable. Until that is, you see an image of someone wearing the GD910. Aside from it looking absolutely massive, anyone using it just looks uncomfortable and worse, damn silly. However, the GD910 looks like a style icon next to the sWaP (that’s Smart Watch and Phone) Rebel, which measures 47mm across and 17mm deep. As a comparison, a sixth-gen iPod Nano is 40mm wide and only 9mm thick. It’s so hideous, there is only one picture of it attached to a person, something presumably done under duress. Now, neither the LG or the sWaP Rebel are particularly new, so it’s reasonable to think the industry has something more attractive for us in 2013. Wrong. Toshiba had a concept smart watch on display at CES in January, and if it’s an example of where the tech is heading, things are no better than they were in 2009. From the mismatched proportions to a bezel so big it would look at home on a shelf with a picture of your dog inside, it truly puts the horror in horology. Aha, say the Kickstarter masses, but what about the Pebble? While its exciting technology and comprehensive features makes the Pebble attractive, the design is sub-Swatch at best, and it’s still really bulky. It’s headed in the right direction, but as an everyday wearable prospect, it’s still not quite there. The trouble with all these examples is they haven’t innovated beyond mixing a traditional watch design with smartphone connectivity. There’s nothing clever or interesting about the designs, and as far as my male eye can see, none probably appeal to women either. If a smart watch is going to be successful – that means selling millions, not thousands – it has to gain its own identity, not just take on aspects of a watch and smartphone, and become desirable to both sexes, regardless of whether they want it as a cool gadget or a fashion accessory. It’s a huge ask, and to get the formula just right may require technology which has yet to reach the market, such as flexible screens and components. 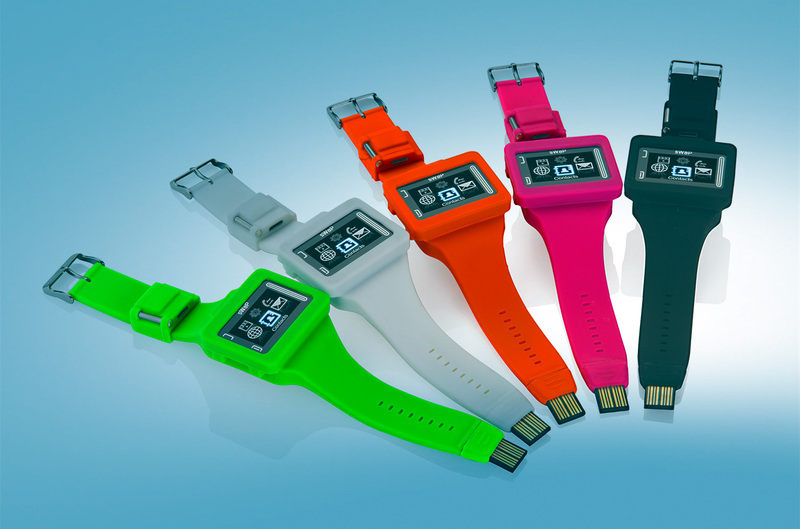 Plastic Logic has the right idea with its smart watch design concept – a device with a color, 1mm thick e-paper screen which wraps around your wrist. However, at the moment there’s nowhere to put all the internal workings, so there’s a bundle of wires and circuit boards hanging off the back. The temptation is to say if anyone can bring us a smart watch we’ll all want to wear, it’s Apple; but Google could have the jump on the iPhone manufacturer this time around, thanks to the work it has put in on Google Glass. Wearable technology excites us immensely, but gadgets and fashion have always been uneasy bedfellows. We’re not convinced the relationship can take the strain of yet another unpleasant smart watch that no-one wants to wear.